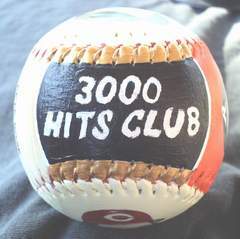 This Legends Hand Painted 3000 Hits Club Baseball features my original paintings of three members of the 3000 Hits Club. 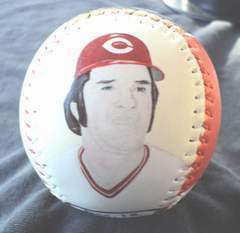 Side one is my close up painting of the all time hits leader Pete Rose. Click here for a closer look. 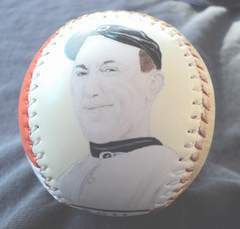 Side two features my close up painting of Hall of Famer Ty Cobb. Click here for a closer look. 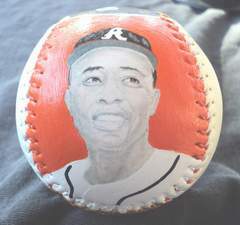 Side three has my close up painting of Hall of Famer Hank Aaron. Click here for a closer look. 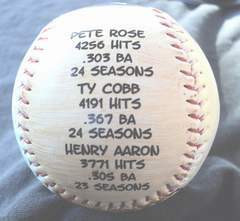 Side four lists these players lifetime hits totals and averages. 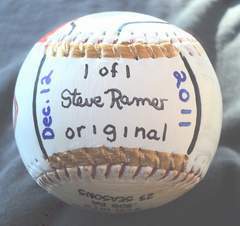 Side five, which is the top of the baseball, has my hand painted "3000 Hits Club".